Are you tired of trying to get online work done on your bed or sofa? Do you need more space for organization? 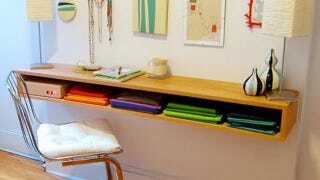 Well if a desk is what you need, then consider just making your own! Study desks can be quite expensive. Save money by building a desk that is just as beautiful and functional as the one you saw in IKEA, except this one won’t be a cookie cutter design, it will be 100% yours! 1.1 Desk and Drawer Combo-Just Add Paint! 1.4 Hideaway Desk-Hide the Mess! 1.7 Standing Desks-No More Sitting Pains! 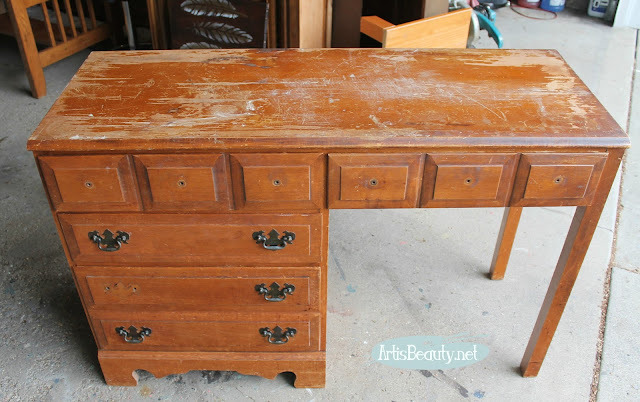 Desk and Drawer Combo-Just Add Paint! DIY doesn’t have to mean you build it from scratch. Sometimes combining pieces is all you need. 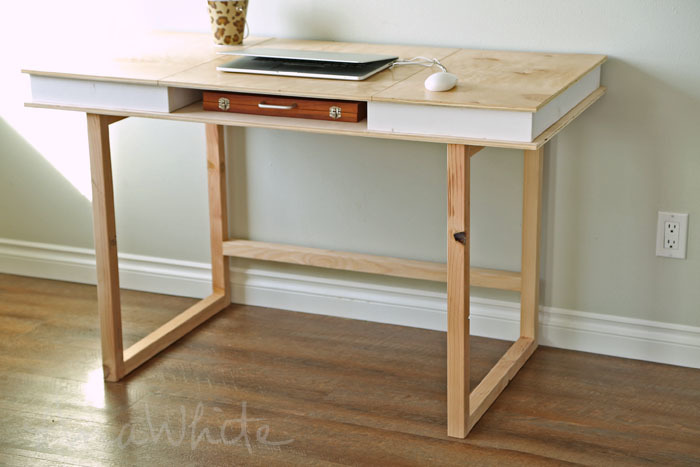 Take a desk that’s this shape, redo the top, and add some old matching nightstands for storage. 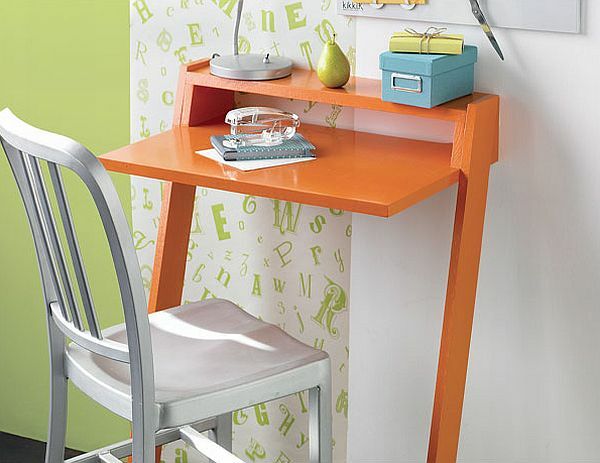 In a few easy steps, you’ll have a very comfortable and one of a kind desk. Don’t be scared off by the mention of power tools. This cute little design is super easy to create and is great for a small apartment. If all you need is a place to comfortably work on your computer, then this is the desk for you. I think it’s safe to say that this is an idea few would have come up with on their own. Which is a real shame as this combination is spectacular. 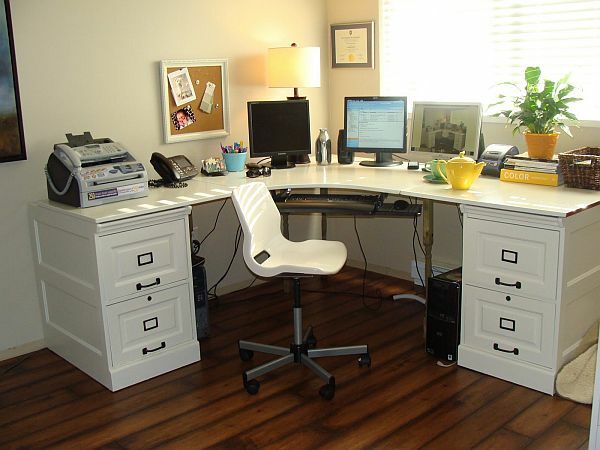 Not only does it give you ample storage space that is easy to reach, but it does so for two desks. If you have a messy workstation that you’d rather not flaunt, then consider making it so you could hide it. This amazing double bookshelf swings on hinges, allowing you to close them like a book! Old and dated desks are quite easy to find. You see them for sale all the time on Craigslist or antique malls. Don’t be put off by their appearance, you can always paint them, and add on extra pieces to make the convenient desk of your dreams. Modern is the way to go when you want to have a clean and uncluttered design. 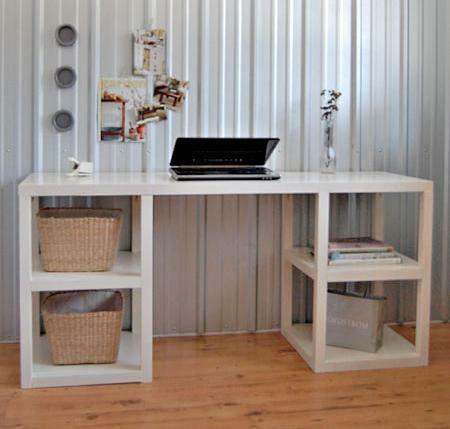 This one is great since it gives you a nice wide platform and large enough spaces for storage. You can keep anything you want on those shelves. Standing Desks-No More Sitting Pains! These stand up desks are all the new rage, and if you’ve ever worked in a chair, I’m sure you will understand why. 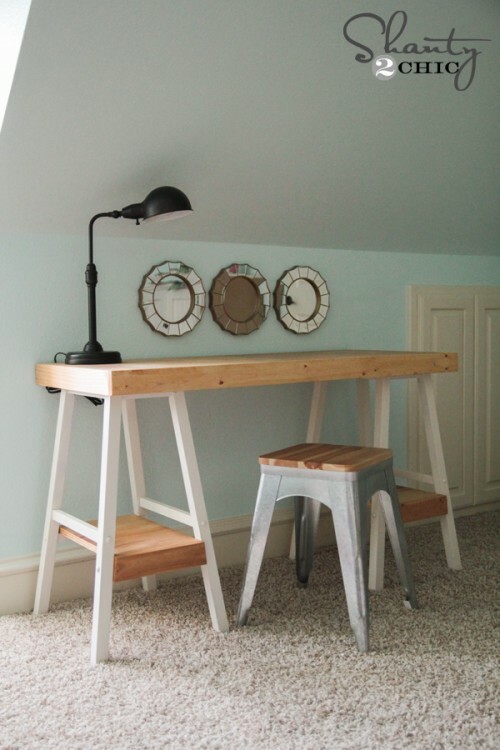 Grab some sawhorses and a table top and you’re good to go! Just make sure you measure the height right. Cool off when you read with a study room fan. This great minimalist design will fit into any home. Not only is it small, but the floating appearance makes it quite stylish as well. All you need is a few oak boards and some brackets! This is a simple design that wouldn’t take you very long to build at all! These plywood planks can be built to swing upward, allowing for some great storage opportunities. When it comes to building a desk, using sawhorses is probably the simplest way of making a desk, or any platform really. Even though it sounds rough, you can always paint any surface and make it look much better. Wooden pallets can be used for a wide variety of home decor pieces. So making a study desk out of one should be a no-brainer. Feel free to cut it and shape it to any size you need and paint it to match the rest of the room. When in doubt, see what you can do with wooden planks. They’re easy to manipulate, and the wood allows you to stain it any shade you like. This might be a recurring theme, but only because it’s brilliant. Not only is it great when it comes to storage, but is also very visually appealing. The best part is that this style is very adaptable to any room shape. DIY concrete sounds challenging, but it’s 100 percent doable. Not to mention it will look stunning once it’s complete. 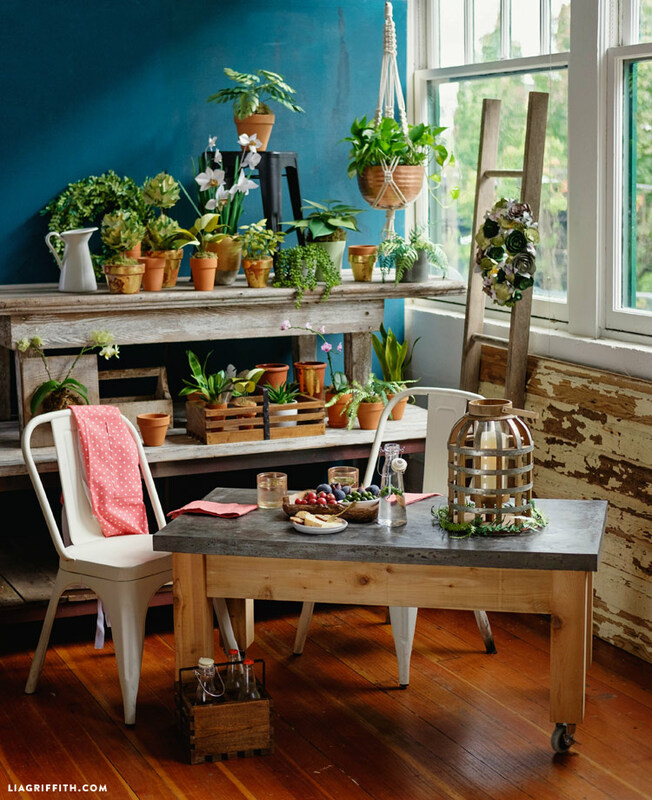 A concrete top is a perfect accent for a rustic look. 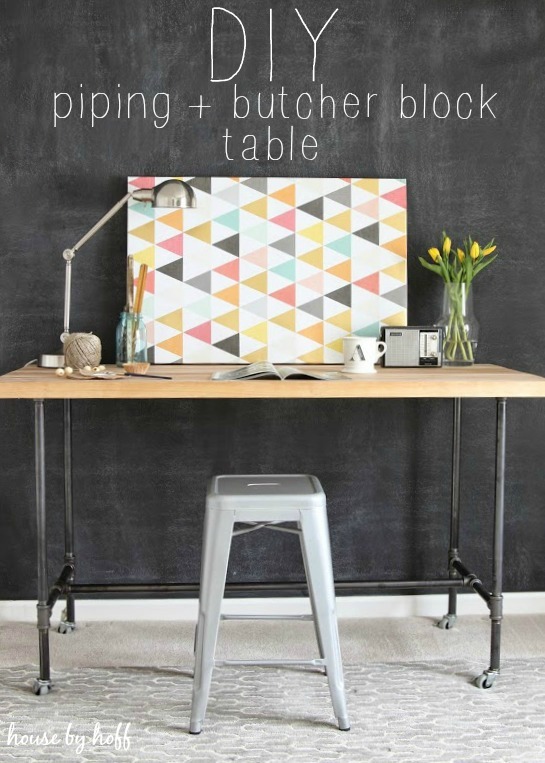 For this popular look, grab some reclaimed wood and industrial piping. If reclaimed wood isn’t your thing, then any sturdy wood will do, such as a butcher block. This is a fun design since you can shape the pipes into any visual you like. Do you happen to have a pair of old stools lying around the house? Well, now you can make them into a very cute study desk. Simply attach a slab of wood to the top and voila! If power tools aren’t really your thing, then don’t worry, you can have a gorgeous desk you design yourself. Simply find an old one, sand it down, and repaint it. You’ll be amazed at how amazing it can look with a few touch-ups! Even though this desk is only made of multiple planks, the visual appeal is huge. By simply putting them at different angles, you can create a desk that easily fits in small places and will be the envy of your visitors. This idea is brilliantly effortless. Find two ladders that you like, and quickly install shelves and a desktop in order to create a clean and efficient office space. 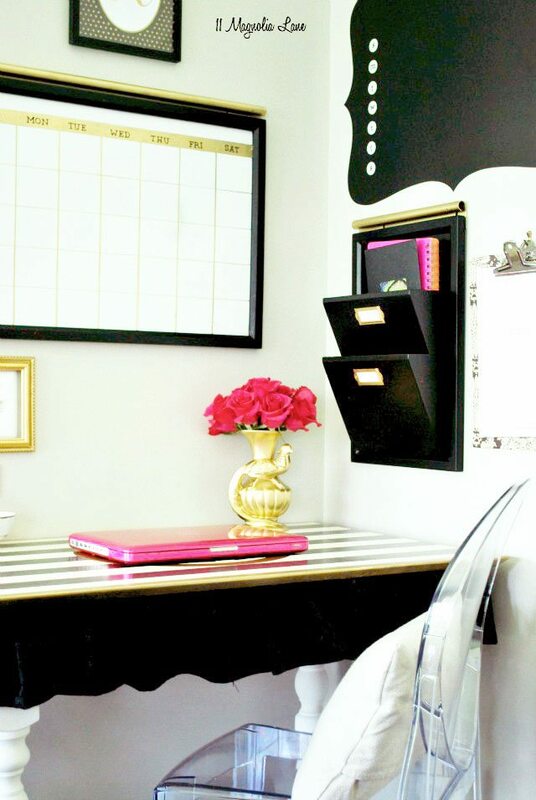 Do you want a glamorous desk, but not have to shell out the money it would take to buy one? This is a great example of how you can make one yourself for much less! It’s not easy trying to design a home office on a budget, but since the desk is usually the most expensive part, this list should help. I hope you were able to find some inspiring ideas whether you need a whole office or a corner for you and your laptop. 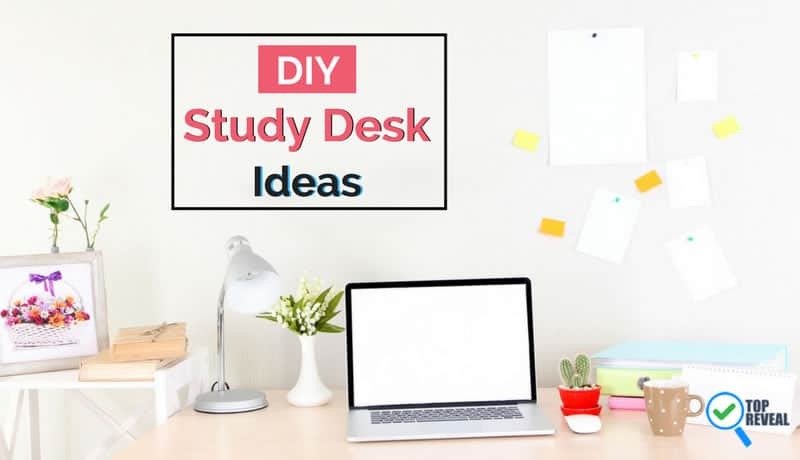 Please let us know what you thought of this list of DIY study desks!